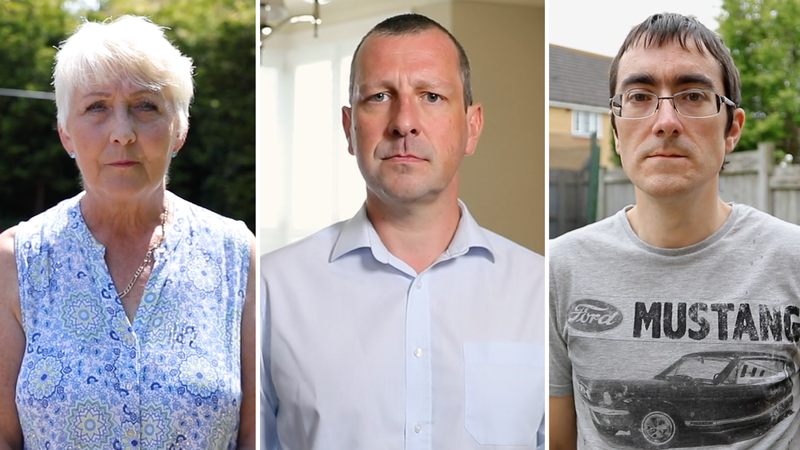 Tales of Tainted Blood - NHS Blood scandal & the people left behind. It’s a very privileged part of our job as journalists that we get to meet some wonderful people who often seem very ordinary but they have a deeply troubling story to tell. We are with such people for a brief moment in their lives. We get to know a person and often their family for just a few short hours but we have the task of understanding and interpreting their story as best we can in our filming and editing. It’s no easy task but this task we have every day we are out on the ground gathering stories. Iv’e recently been involved in producing a three part series of self-authored VT’s that tell the stories of people profoundly affected by the biggest scandal ever to hit the National Health Service, we interviewed Matt at his home in south London where he lives with his wife and two children. Matthew Merry is a Severe Haemophiliac and has been since his birth thirty seven years ago. When he was seven he was given injections of a blood plasma called Factor Eight that was designed to help his blood clot but instead of helping him stay healthy it contained Hepatitis C and HIV. He has been living with these conditions his whole life. Matt’s full story can be found by following the following link to the BBC Stories page: https://www.bbc.co.uk/news/resources/idt-sh/the_secret_in_my_blood It was written by Jon Kelly who came along with us for the filmed interview. 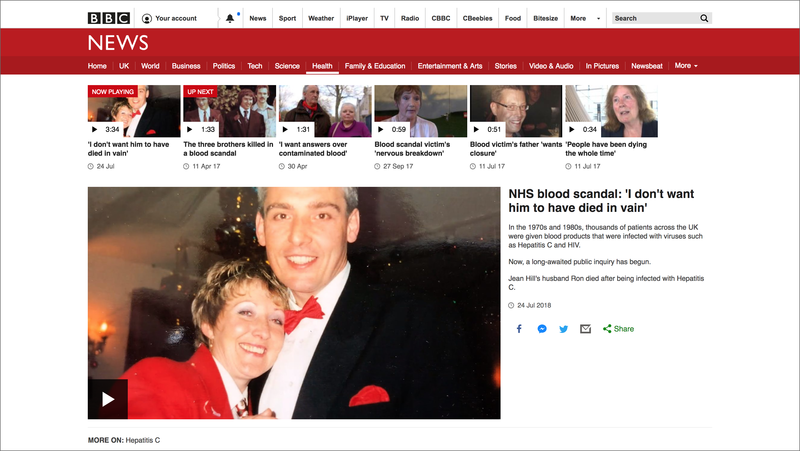 In the 1970s and 1980s, thousands of patients like Matt across the UK were given blood products that were infected… Now, a long-awaited public inquiry has begun and to tell the story of this scandal producer Gabby O’Donnell and I were tasked by the Six and Ten to produce three pieces that showed the personal impact that this has had on the people left behind. The first of our other two VT’s features Tim Wratten who lost his Haemophiliac father Peter who died after he was infected with Hepatitis C and the second tells the story of Jean Hill from Torquay who also lost her husband Ron to Hepatitic C.
This is Jeans VT, she and her two daughters welcomed us into their home and trusted us to show some very private elements of their life to the wider world. Friendly and welcoming all three of them were incredibly patient with the whole process of filming, they even went out and bought us all pastries for breakfast. These VT’s were filmed over three consecutive days back in June on my Canon C300 Mkii and my 5D MKiv and then edited over three days using FCPX. They ran on BBC News Six and ten last week. If you’re going to try and be clever and use two cameras single handed at least make sure the colours, midtones and blacks match otherwise what’s the point? Hi J thanks for the comment, point taken… However it’s not particularly ‘clever’ using two camera’s on any shoot. Pushing the boundaries on what one can achieve on a news job is something we should all do if we want to compete with our peers and produce better content, also if having two camera’s on a shoot helps the editing process then there’s every point in using them. I do admit I have a little work to do in getting the two cameras to match and I am learning how to colour correct effectively in post but I think to focus your comment on that alone and say there’s no point then you’re not being very ‘clever’ yourself. Thanks for the feedback though.